__Imagining new wealth creation models. __Imagine a wealth creation model that doesn’t require any raw material endowment, like Silicon Valley, or Singapore! It’s good to have oil and platinum, and to grow cocoa and coffee. But for citizens to benefit from a nation’s natural resources, it’s critical to have the best stewardship, and to eliminate corruption. Without a culture of respect for rule of law, all future wealth creation models are doomed to failure. __The bottom line is: We can no longer allow our national economies to be underpinned solely by the export of raw materials. If we’re not careful, we can even become dangerously addicted to them, such that African nations, workers, and citizens in general are forced to endure endless boom and bust cycles… When the price of oil is up, we're doing well; when it goes down, we're scrambling… copper, platinum: boom, boom, bust! It’s happening now. 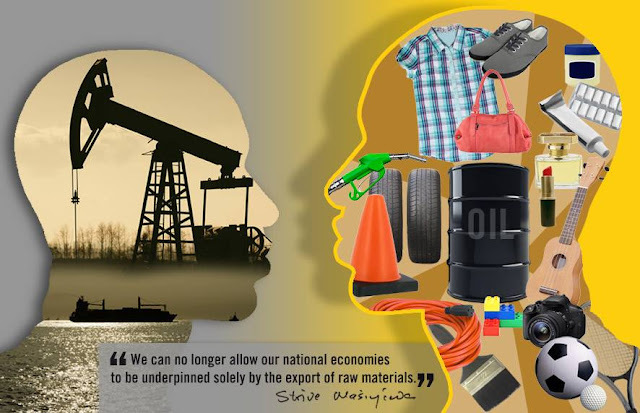 We must prioritise the development of innovative capacity to redeploy our rich natural resources within our own economies. It goes beyond the simplicity of "processing" and so-called "beneficiation." That’s not enough. We must also pay attention to emerging technologies and how they’re likely to affect the businesses we’re familiar with today. My appeal to this next generation is to get us out of a “wealth creation model” underpinned by export of natural resources. We can no longer afford to think of the wealth of our nations in terms of mineral and raw material exports. Not when you know there's a Silicon Valley; not when you know that Apple Computers Inc. is worth almost the same as Nigeria’s and Angola’s combined GDP! Not when you’re the generation that knows about Alibaba, Tencent, Uber and Skype! __Within the next 25 years, we must break our addiction to resource-driven economic wealth. It's time to turn to our African inventors, innovators and entrepreneurs.